All-Fill of Exton, PA, is a leading designer and manufacturer of filling machines and packaging equipment. 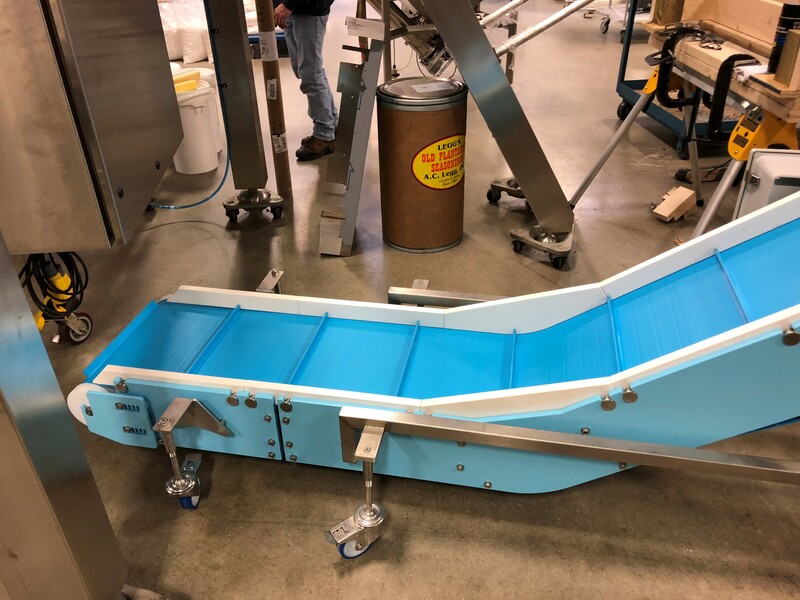 When one of their customers needed a system for bagging stuffed olives, peppers, spices and oil, All-Fill knew they would need to include a wash down conveyor as part of the turnkey system. Knowing that it was a wash down operation that would require a high level of cleanliness in the design, Raymond Arra, Sales Manager at All-Fill, knew that he needed a sanitary conveyor that would be easy for his customer to clean. Arra reached out to Dynamic Conveyor for such a conveyor. Dynamic Conveyor offers a hygienic line of conveyor systems that are ideal for the food packaging and processing industries. The patented design of the DynaClean line allows the conveyor to be quickly disassembled, cleaned, sanitized, and returned to service without the use of tools. To replace the manual process of bagging the product, Arra designed an automatic system where the product is filled into bags utilizing a combination scale. “The bagged product is then conveyed on a DynaClean conveyor to an accumulation table where operators remove the bags. The bagged products of stuffed olives, peppers, spices and oil are then sold to salad bars,” explained Arra. After All-Fill placed the order and received the conveyor, the customer recognized that the flow of the layout was not ideal for the existing packaging room and changed the line layout from an in-line discharge to a 90o perpendicular discharge. Arra reached back out to Dynamic Conveyor because the DynaClean conveyor would not work with the new system layout. The infeed section of the conveyor was too short for the newly proposed system design. Fortunately, Arra selected a DynaClean conveyor for the turnkey system instead of a fixed length stainless steel conveyor. 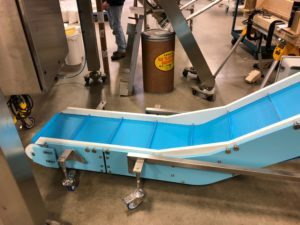 With the DynaClean conveyor system, All-Fill was able to purchase an additional section of conveyor from Dynamic Conveyor that allowed the existing conveyor to grow in length by 24”. “I had no idea the DynaClean conveyor system was modular and could be retrofitted in the field,” explained Arra. If a stainless steel conveyor had been originally purchased for the turnkey packaging system, they would have been required to purchase a whole new conveyor to fit within the design constraints of the newly proposed layout. Arra was relieved when he learned that he would not need to purchase a whole new conveyor. Dynamic Conveyor was able to provide the additional section of the conveyor and Arra was able to rebuild the conveyor. “It was very easy to install. It took about an hour to make the necessary changes using common hand tools. Even though the conveyor has been modified, it looks like a brand new conveyor,” said Arra.